One of my dear friends is having a baby next month, so of course I just HAD to make her a baby quilt. She's having a baby girl and is decorating using purples and greens. Don't you love when someone tells you what colors they're using? It makes it easy to pick out fabrics, although sometimes I enjoy coming up with my own fabric combinations. Her baby shower was this past weekend, so I was able to give her this baby quilt in person. I was so happy that it was still well received and everyone, including mom and dad, loved the quilt. I had a fat quarter bundle already with a bunch of greens, purples and blues, so I went with it. I cut 3 1/2" strips and cut a bunch of triangles using my Hex N More ruler. I did add a couple of additional fabrics, because I can't just leave something as is! I pieced the top while at retreat and machine quilted it there on my domestic. I haven't quilted on my domestic in a little while, but it was fun. Heck, quilting anything is fun. I backed it in a fun print I got at Marden's last year at retreat. I think it's a Michael Miller fabric. I bound it in a purple print I got at Marden's this year. I totally forgot to bring a binding fabric with me to retreat, so I'm glad I bought something that magically worked. I can't wait to meet the baby, and I hope this quilt is loved. I stressed to the mom that when I give a quilt, it's meant to be loved and used. I even gave her a card that said to use the quilt and wash it as needed. I'd love to make another quilt for the baby because it was loved so much! That's the best feeling in the world for a quilter, wouldn't you agree? How beautiful it is! And the giraffes on the back are wonderful! It is VERY nice when the recipient loves what we've poured our heart and soul into. Part of the reason why we do what we do, right? Oh this is lovely! Perfect mix of fabrics! Beautiful quilt and I love the colours!!! What a beauty! And I totally agree about using a quilt: why would you make a quilt, if it wasn't to be enjoyed?! So nice Jen! Great job. I might have to try a triangles-only quilt one of these days. What a lovely quilt! The colors are gorgeous! Lovely colors! I totally agree its just awesome when you know that the quilt is well received and will be loved for years to come. Triangles are everywhere these days! Very pretty! It is a great feeling when you know the recipient appreciates your work! You are really inspiring me with these triangles! 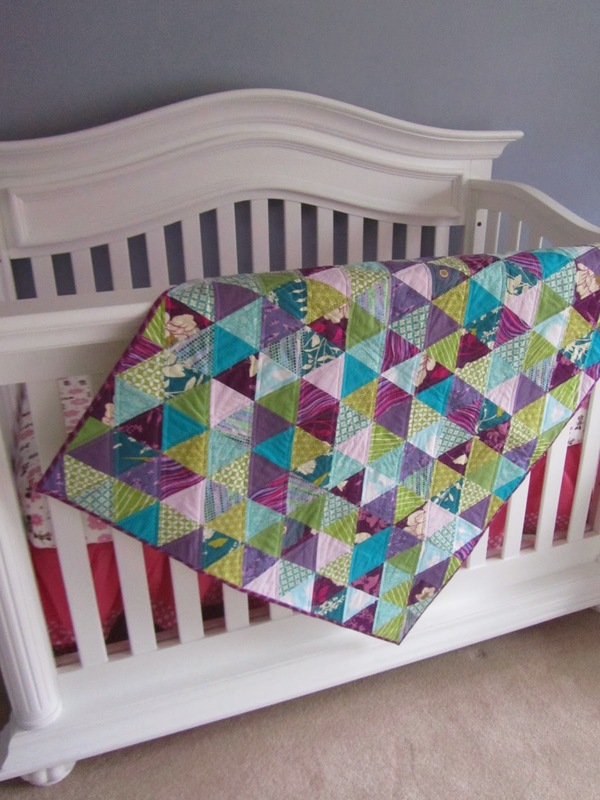 Love triangle quilts anyway, but purple and green make it really something! Love!